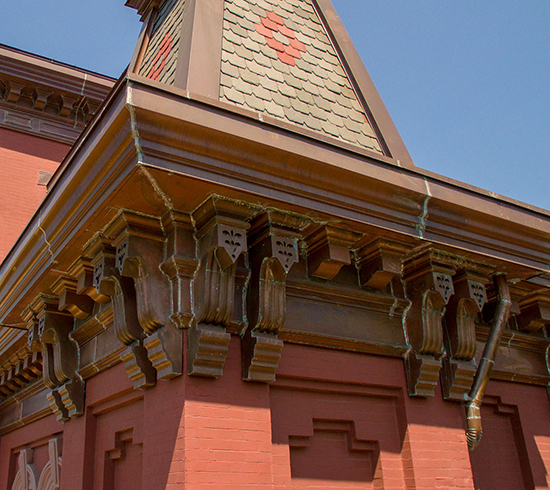 Gotham Metalworks by Extech received the 2015 North American Copper in Architecture Award for its work on the Henry Bristow Landmark School in Park Slope, Brooklyn (NYC Public School 39). Presented by the Copper Development Association, the award is judged by industry experts and presented to outstanding copper building projects based on design integration, craftsmanship and overall excellence in renovation. The project involved the historic restoration and roof cornice replacement for one of the nation’s oldest schools in continuous use (built in 1877). Working with Ivan Brice Architecture, Gotham’s was to fabricate the new copper gutters and cornice and stay true to the design intent of the original construction. All elements were subject to approval by the N.Y. State Historic Preservation Office. The copper work included manufacture of the 44 decorative replica brackets, 308 large modillions and extensive cornices with hundreds of dentils. Castings and dies were made from the original wood decorative brackets, and fluted bracket faces were stamped in copper to match. The decorative Fleur de Lis detail, which was cut into the face of the decorative brackets, was utilized to create matching snow guards on sloping copper roof areas where needed. Visit GothamMetals.com.